Bargaining Theory can help us to better understand why states go to war by looking at the range of rational agreements that can be made in order to avoid war. 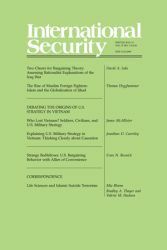 Since war is always more costly than the range of mutually acceptable outcomes that states face when they bargain to resolve a dispute, bargaining theory argues that war is therefore a failure and states should be able to reach a rational accord. While bargaining theory can help us to understand the causes of wars and ways in which they can be prevented, it is nevertheless lacking in a few key areas. According to Lake this has become all too apparent from the war in Iraq. The theory’s failure to fully explain why the war happened, despite the presence of several less costly alternatives to war that both sides could have taken, warrants another look at its assumptions and ways that they can be modified to better-fit reality. Bargaining theory is modeled in terms of two-player games. War is over once a settlement is reached. The assumption that states are unitary actors belies the presence and influence of internal actors. Organizations and individuals, such as special interest groups and lobbyists, can shrink the range in which governments are willing to bargain and therefore make them more belligerent and willing to go to war in lieu of better options. In the context of the Iraq War, Lake points to groups such as the Israeli and oil industry lobbies that, in pursuit of their own interests, wanted to see a war in Iraq. This in turn may have helped goad the Bush Administration into becoming more aggressive and ultimately made the decision to go to war more appealing. Lake as well challenges the two-player game model of bargaining theory, which only looks at a pair of states, A and B, interacting. He contends that this view is oversimplified and does not account for other external actors that states A and B may be influenced by. For example, while Iraq did not have WMDs it did not make this clear to the U.S. despite the threat of invasion. The Iraqi regime did so because they were afraid of emboldening regional adversaries such as Iran into becoming more aggressive towards them. These sorts of signaling complexities are not present in an A and B model. The Iraq War also raises the question as to whether a war can really be considered “over” simply when sides A and B reach a settlement. The cost of the Iraq War is considerably less if one were to only look at it in the frame of major military operations. However, the cost of the post-war reconstruction phase becomes significantly higher. Therefore, if the entirety of the cost were considered during the bargaining phase, the decision to go to war would have looked much less attractive. Finally the assumption that states act rationally overlooks the fact that the people leading them may be affected by deep cognitive biases that can severely affect their judgment. Lake argues that President Bush and his administration made assumptions that were based on previously conceived beliefs. Additionally, groupthink and an aversion to dissenting opinions were decisive factors in not fully assessing the potential costs of the war and deciding to invade Iraq. Influential internal actors, such as special interest groups need to be taken into account when assessing factors in decision making. Postwar governance needs to be added into the overall cost for the victor. If the costs are small then they play a minor role in conflict behavior, however if they are high, then it will affect the original decision to go to war. A behavioral theory of war needs to be further developed that accounts for “cognitive and decision making biases.” Lake finds this to be the most sever challenge to bargaining theory but believes that one can be developed that would compliment bargaining theory. Making sure that all points of view are considered when making decisions. He believes this could be accomplished by creating competition between agencies rather than having them all under unitary direction, so that the president hears more varied opinions. Conflict Structure – Such as whether or not the conflict is interreligious, very bloody, or involves blatant foreign invasions. Insurgent Profile – Foreign fighters may join conflicts where the local insurgents have certain characteristics, including strong Islamist ideology or preexisting links with other countries. Government Obstruction – Actions such as the degree to which a government cracks down on recruitment or makes it harder to enter a country where there is an ongoing conflict. Communications Technology – Global foreign fighters may require communications technology not in existence before the early 1980s. Additionally the increasing ease of world travel and lower transportation costs make it easier for them to reach foreign conflicts. The Evolution of Islam – The rise of modern Islam may have contributed to the increase, even though it has been around well before the 1980s. Hegghammer believes that while these first five reasons may very well contribute to the increase of foreign fighter presence in Muslim world conflicts since 1980, they do not fully account for it individually. He believes that the 6th possibility is the best explanation. After 1980, a distinct new ideological sub movement emerged within Islam that did not exist prior. Hegghammer finds that there is a significant overlap in personnel, recruitment literature, and funding sources within this movement. This overlap established strong ideological, social, and organizational links. To further test the sixth hypothesis, he examines recruitment propaganda from Muslim world conflicts involving foreign fighters in that time period. He finds a trend within the propaganda that consists of a diagnosis that the Muslim nation faces an external threat, a prognosis that Muslims need to fight back militarily in the subject area, and a rational that Islamic Law requires all able bodied men to join the fight. The common theme is the appeal to Islamic Law and the unity of Muslims over a common enemy. This differs from existing jihad doctrines in that it focuses on an outside enemy when Islamist revolutionary doctrine is concerned with the enemy within. As well, it puts more of the responsibility for fighting on the individual where before it was seen as the responsibility of the community. Individuals were not allowed to travel to participate in the conflict without the explicit permission of “parents, creditors, and political authority “(75). Based on these findings he believes that foreign fighters constitute their own unique subgroup with a distinct ideology from other kinds of violent actors. Anyone wishing to curb foreign fighter recruitment should understand that the recruitment messages are not reliant on “complex theological arguments” but rather on a “populist anti-Western” theme. Therefore the focus should be on countering such themes in Arab news networks and propaganda on the Internet. Western policy makers should remember when using public diplomacy to communicate with Muslim populations that these people see foreign fighters and international terrorists differently and that grouping the two together can cause communication problems and misunderstandings. In his article “The Myth of Military Myopia: Democracy, Small Wars, and Vietnam”, Jonathan Caverley theorizes that Vietnam was lost largely because the civilian government of the Johnson Administration forced the military to accept a specific strategy it did not want. He charges that General Westmoreland and the military were forced by Johnson and his advisors to accept such strategies as using heavy firepower to pummel the enemy, which requires large material expenditures, instead of effective counter insurgency and pacification strategies that would have instead required heavy personnel expenditures and loss of life. According to Caverley, Johnson lost the war by investing in strategies that would keep the loss of life low as not to lose public support and thereby denied the military resources it needed to win the war. Caverley extend this line of reasoning to argue that there is an overall trend in democracies being unable to allocate the correct resources to counter insurgency operations for fear of losing support of the electorate. General Westmoreland, for the most part, pursued his own strategy and was not instructed to fight within South Vietnam in the way he did by the Executive Branch. There was no dispute between the civilian and military sectors of the government over pacification strategy, and even if Westmoreland had acted on his own he still would not have pursued a counterinsurgency (COIN) or pacification strategy. Caverley’s theory about voter preference having a deciding affect on how the Johnson Administration conducted the war is unsupported or contradicted by the evidence. The article concludes by blasting Caverley for cherry picking “sentences and phrases” that support his theory rather than looking at the documents as a whole to see whether or not his theory is at all viable. As well, McAllister closes by stating that he believes the war was “unwinnable at an acceptable cost by the summer of 1965.” The burden of success for counterinsurgencies ultimately lies in the hands of the host nation, and cannot be substituted for with US “blood and treasure.” In this way it was the inability of the South Vietnamese themselves to effectively carry out COIN operations that was to blame for the loss of the war. Responding to McAllister’s “Who Lost Vietnam?” that critiqued his “The Myth of Military Myopia” article, Caverley attempts to defend his cost distribution thesis that civilian distaste for high losses of human life led the civilian Johnson administration to opt for a less effective strategy focusing on heavy material expenditures, as opposed to personnel. Caverley believes that McAllister’s logic and evidence do little to dispute his Vietnam theory. He shows how his argument fits into mainstream Vietnam War historiography and suggests that deductive reasoning can play an important role in addressing puzzles that remain in this field. Because McAllister does not distinguish between necessary and sufficient causal explanations his evidence is of little use for testing cost distribution theory against arguments resting on military nearsightedness. He disputes the claims that there is little evidence for both the assertion that Johnson pursued capital-intensive approaches and that there is a link between voter preference and military strategy. Assesses McAllister’s conclusion that the South Vietnamese government’s inability to fight for itself was the main underlying problem. McAllister’s claim that Westmoreland and the military wanted to pursue the course that was taken regardless of the civilian leadership’s wishes is inconsequential according to Caverley. The military was bound to have the same view as the civilian leadership since they were appointed by them. McAllister also only looks at three of the document interpretations that Caverley makes and even his counter analysis of those is flawed, as is his assertion that those documents do not contain enough evidence to substantiate Caverley’s claims. Finally, McAllister’s claim that the war was unwinnable thanks to the general inability of the South Vietnamese government to deal with the insurgency on its own is flawed for two reasons. First, the fact that the South Vietnamese government was unable to hold out on its own is the reason the US was involved in the first place, and therefore cannot be considered a separate factor from the efforts of the US military. Second, just because there were multiple reasons for failure does not undermine the integrity of Caverley’s argument as another contributing factor in that failure. Neorealist Hypothesis – The U.S. is less committed and dependent on its alliances of convenience since it is more powerful relative to its ally and less proximate to the shared threat. Therefore, since America does not need an ally as much as an ally would need America, the U.S. has a stronger bargaining position that it can use to gain the upper-hand on issues it is strongly interested in. Two Level Games/Tying Hand Hypothesis – U.S. negotiators are more constrained than their counterparts in authoritarian regimes, since they have to work within a democratic system and answer to a broader electorate. Therefore they can say that their hands are tied which constricts their bargaining position to more acceptable options. In that way the United States gains more concessions from its ally and successfully bargains. Neoclassical Realist Hypothesis – The U.S. is “weak” internally because it has to conform to domestic constraints characteristic of a democracy, while autocratic allies are “strong” since they are not held back by such limitations and thus can bargain more aggressively. While the Two Level Games/ Tying Hands Hypothesis believes that the democratic regime is favorable for the United States in negotiations with its authoritarian counterparts, the Neoclassical Realist Hypothesis states that U.S. foreign policy negotiations are bound to fail because of the need to appease various interests and parties that are given a voice in democracy. Therefore U.S. bargaining is bound to fail, even on issues that it is strongly invested in. According to both the Neorealist and Two Level Games Hypotheses, the U.S. should have bargained aggressively with Iraq during its time of alliance. The third hypothesis, however, predicts failure for the U.S. bargaining position. However, when Resnick applies the empirical evidence from the U.S.’ relationship with Iraq during its war with Iran, it is found that the Neoclassical Realist Hypothesis is the most valid. He picks the two main points of contention in the relationship, Iraq’s development of nuclear weapons and sponsorship of terrorism, and finds that Iraq usually persevered in both instances. Individuals within the State Department, Congress, and special interests constrained the resources of the Regan Administration and prevented it from having the ability to make credible threats or offer incentives. This inhibited any attempt to bargain aggressively. The U.S. should take pause when considering the formation of an alliance of convenience since domestic bargaining “pathology” can unintentionally lead to the creation of an even stronger future adversary. The U.S. can reduce the anticipated costs and risks of an alliance of convenience by keeping the relationship as covert as possible and thereby avoid domestic pressure. © Copyright Hand of Reason 2019. All rights reserved.